A new work by our very own Fran Winston opens at the International Bar next week. It is written and performed by Fran and tells the story of “domestic violence from the inside out”. This is the third run of the play as it featured in the Smock Alley ‘Scene and Heard’ Festival in 2017 as well as a previous outing at the International Bar. This run is the most fully developed to date, with Loft Productions coming on board to produce. 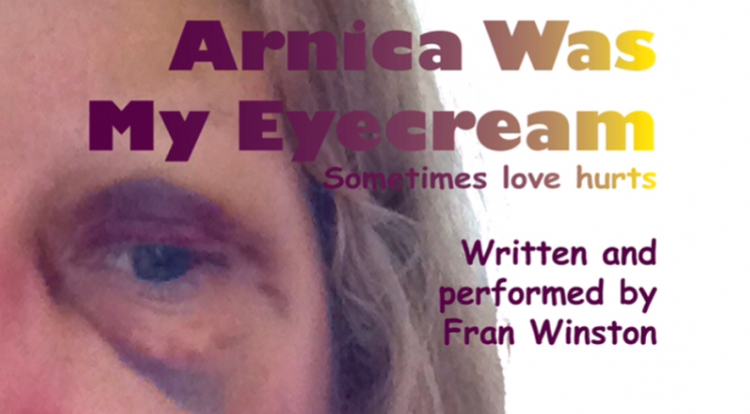 Up and coming production company, Loft Productions Ireland in conjunction with Princess Frannie Productions, is bringing, ‘Arnica Was My Eyecream by Fran Winston to The International Bar this June. This fast-paced performance will take you on a rollercoaster of emotions, as you follow the relationship of Nancy and Marcus. Nancy is an ordinary woman living an ordinary life until she meets Marcus. A total Prince Charming he sweeps her off her feet in more ways than one. Pretty soon she is rethinking the contents of her makeup bag – what colour does blend with purple to make it disappear anyway! But it’s fine. After all he bought her chips. Arnica Was My Eyecream tells the story of domestic abuse from the inside out. Speaking on her vision behind the production, Fran Winston says: The performance is a hard hitting play looking at the serious issue of domestic violence through the eyes of one victim, Nancy. It shows how an ordinary person can get unwittingly trapped in a cycle of abuse. She continues: In Ireland 1 in 5 women will be victims of domestic abuse (although it is believed the figure is closer to 1 in 3 but lack of reporting affects the figures). Yet it remains a largely misunderstood topic still spoken of in hushed tones. There’s no denying it’s a dark subject. On average a woman will be assaulted by her partner or ex-partner 35 times before reporting it to the police and even then last year only 29% of women who experienced severe abuse reported it. And many rarely tell their story to anyone. It shows how surprisingly ordinary the abusers are and how surprisingly easy it is to fall victim. This is Nancy’s story but it is also many people’s story and it is happening to someone you know right now. She tells her tale in the hope that people will better understand the realities of domestic violence.